The new head of the IOC, Thomas Bach, promised to effectively fight corruption and doping, and called the Olympic Games in Sochi his number one priority. 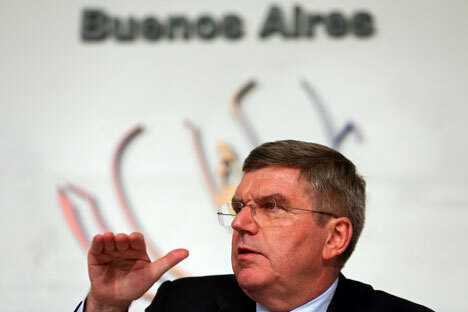 On September 10, during the 125th Session of the International Olympic Committee in Buenos Aires, Thomas Bach was elected as the new head of the organization. The German became the ninth president of the IOC, managing to beat out five other candidates, among whom was the famous pole vaulter Sergey Bubka. Bach acknowledged that the day he was elected president of the IOC was "one of the longest and most emotional" of his life. "In sports, the winner is obvious right away, but we had to wait a whole hour," said the ninth head of the IOC about the emotions he experienced. A former member of the national fencing team of Germany that earned an Olympic gold medal in Montreal in 1976, Bach replaced Jacques Rogge, a Belgian, as IOC president. It was during Rogge's presidency that Russia won the right to host the Olympic Winter Games for the first time in history. The Sochi Olympics will be held under the new IOC president, who declared that he will put forward maximum effort to host the Olympics at an appropriate level. "Of course, the Olympic Games in Sochi are the main task at the beginning of my journey, because the event is just five months away. I will put forward maximum effort to see that the Olympic Games in Sochi are successful," Bach was quoted as saying by R-Sport. The first official foreign visit of Thomas Bach will be directly connected with Sochi. The new president of the IOC intends to go to Greece to personally witness the lighting of the Olympic flame on Mount Olympus. One of the first things the 59-year-old Bavarian did after he began his new position was to congratulate the president of Russia, Vladimir Putin. "The president praised the work of the IOC in preparing for the Olympic and Paralympic Games in Sochi in 2014," said Dmitry Peskov, Putin's press secretary. "We agreed that Bach would visit Russia, and in the course of this visit we would continue our dialogue," added Peskov. The new president of the IOC may visit Sochi in the near future. Honorary President of the Russian Olympic Committee Vitaly Smirnov told Russian journalists that it had already been agreed upon. "It is important that an Olympic champion will head the IOC for the first time in history, so we are very happy," said Smirnov. For Russia the 125th session of the International Olympic Committee was marked by another important event: Alexander Zhukov, head of the of the Russian Olympic Committee, was elected as a member of the IOC. He received 63 out of 92 votes from members of the organization. Zhukov is the fourth Russian representative to the IOC, together with honorary president of the Russian Olympic Committee Vitaly Smirnov, president of the Russian Tennis Federation Shamil Tarpishchev, and four-time Olympic swimming champion Alexander Popov. New IOC member Zhukov is confident that Thomas Bach will continue the course of development that was laid out by the previous head of the organization Jacques Rogge. "Thomas Bach, is, of course, an extremely worthy candidate, but then all six candidates were worthy. The course that has been set in recent years by Rogge, who certainly was a very successful president, will be continued by Bach," Zhukov told reporters. "I have known Bach for a long time, he is a very serious person," added Zhukov. “He is a winner in his heart, as is any Olympic champion. It is impossible to become an Olympic champion without drive. He is very experienced, a good diplomat, and very well acquainted with the Olympic movement and sports. I am sure that the Olympic movement will continue to develop with his election." Thomas Bach, answering questions from reporters, confirmed that he will continue to pursue a tough policy on the fight against corruption and doping. In particular, he offered to work more closely with governments around the world and Interpol to pursue cases of bribing officials and match fixing, as well as work to toughen legislation in necessary areas.